Dandelion Control: When Is The Best Time? Can you still remember the dandelions in your lawn last May? Did you spray them, dig them, or just wish they weren’t there? You have probably thought dandelions and other lawn weeds are plants you could get along nicely without. Of all the lawn weeds with which we have to contend, dandelions and plantain are the most widely found and abundant. 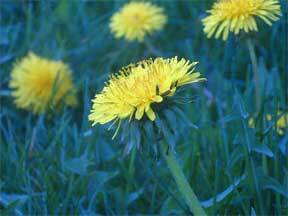 Most home owners become concerned with getting rid of dandelions when the pesky little yellow flowers show up in profusion in lawns during spring. More people try to control them in spring than at any other time of the year. Actually, waiting until spring to undertake dandelion control measures, is where many people make their first mistake. In the spring, other garden and yard work is pressing. Everyone is in a hurry. They spray rapidly and take unnecessary chances of fumes and spray drift. Other plants such as grapes, roses, nasturtiums, and tomatoes, are also young and succulent. The neighbor’s plants are also in the most succulent growing condition. Spring spraying of a dandelion weed killer is a booby trap which the wise home owner should avoid. During spring and early summer, dandelion populations build up. Seeds have been produced, germinated and established themselves as young seedlings. Given two or three favorable months to grow, they will be ready to bloom next spring. If you sprayed your lawn last spring with a dandelion killer, another crop is already present to greet you next April. If you spray them again next spring, maybe you will again get only partial control. There are several reasons why fall spraying is much better than spring spraying. 1 In the first place, you catch every single seedling which has established itself since last spring. If the number of plants involved is large, give the entire area a “blanket” spray. This should make for a dandelion-free lawn next spring. If only scattered plants occur, “spot” spray or “spot” treat the individual plants. 2 In the second place, there is usually more time for yard work of this kind in the fall, as the season draws to a close. Consequently, you can pick a day which is most favorable for application and you have a little more time to apply the chemical carefully. 3 In the third place, and this is important, other plants are much more resistant to injury. Maybe frost has already killed them. Certainly the heat and dry weather of summer have made them much more resistant to injury. This does not mean that you can go about and spray with abandon. You still have to be very careful. To be on the safe side as much as possible, wait until after one or two light frosts. Such plants as tomatoes, nasturtiums and garden vegetables will have been hurt by frost. Many are harvested and the garden, in many instances, has been “retired” for the season. Plants like roses, grapes, and other fruits and ornamentals have been hurt by the frost, have dropped some of their leaves, or if they retain these leaves, they are no longer very active physiologically. The fruits, ornamentals, and vegetables which are left, are in a hardened condition due to summer heat and drought. Consequently, injury to all crops is infinitely less in fall than in spring when they are young, succulent and actively growing. Herbicides containing 2,4-D are most effective for control and a great aid of the lawn enthusiast. It must be carefully used. Always read the label before applying and chemical to your plants … and that includes weeds too! I’m not aware of any good organic dandelion killer. The 2,4-D compounds cause no injury to grass when used according to recommendations. If applied conscientiously as a “blanket” spray, this wonderful chemical detective will ferret out every single last dandelion. Not a one will escape. This is a difficult question to answer since the concentrations of practically all commercial preparations vary a great deal. Simply follow the directions on the package. In the absence of clear cut directions, use one tablespoonful of 2,4-D concentrate per gallon of water. Often, dandelions, plantains, and other lawn weeds grow in the shade and they are usually harder to kill in the shade than they are in full sunlight. In the fall there is always leaf drop of deciduous trees. Remember that the chemical spray must hit the dandelions to be effective. If frost has caused leaves to fall and cover the dandelions, such leaves should be removed first before spraying is done. The dandelions must be completely covered to get good results. If the spray is deposited on fallen leaves which are later removed, the dandelions will not be hurt. The chief weeds injured are dandelions and plantain. However, there are such plants as the fall forms of bull-thistle, tall thistle, yarrow, pepper-grass, shepherd’s-purse, and buckhorn which are hurt by fall spraying. A temperature of 75 to 85 degrees is advisable. Watch the weather forecasts. Spray only when there is no danger of rain for 24 to 48 hours. Lower temperatures make for slower kill. If rains occur in the meantime, some of the effect of the chemical is lost. Often in the fall of the year, weeds are tougher than usual. Even mildew has toughened the leaves of the dandelions. Consequently, a wetting agent, or any household detergent, used at the rate of one teaspoonful per gallon of spray solution makes for better coverage, better absorption, and consequently better kill. Nope! However with a dandelion spray, the plants will die. But remember that for every conscientious home owner there is the proverbial “good neighbor” who doesn’t believe in spraying, who doesn’t mind dandelions, who likes these early “harbingers of spring,” who likes them for greens, who is color blind, in short, one who just doesn’t care. Such a careless individual can supply seed for a whole block of lawns. For that reason, if you want a dandelion-free lawn every spring, you must do a touch up job every fall. That’s especially true if you have had a dry summer and the vigor of the grass has been injured to the extent that dandelion seedlings were able to establish themselves. Are All Weeds Controlled by Fall Spraying? Unfortunately, fall spraying is not the complete answer to all weed control problems in a lawn. Some weeds are best controlled by spring spraying. The best examples are dooryard knotweed and red sorrel. The red sorrel is a perennial which is rather inactive in the fall. Consequently, fall spraying is not very effective. Door-yard knotweed has already gone to seed in the fall and is most susceptible early in spring when it is in the two leaf stage. Both of these plants must be sprayed when they are young. Spring spraying is, of course, feasible if extreme care is practiced at the time the application is made. For the two specific weeds mentioned and for some others such as chickweed and some of the peppergrasses, spring application is best. The majority of the weeds such as dandelions and plantains, however, can be best controlled by fall application. It would be wrong to think that no precautions have to be practiced when spraying is done in the fall. When using 2,4-D, care must be taken regardless of the season. Always choose a quiet day to spray. Even at that, establish a safety zone and stay a foot or two away from the most highly prized ornamentals. Remember that equipment used for the application of “weed killing” is very difficult to clean, and would be risky to use on such plants as grapes, roses, tomatoes, and nasturtiums. It would be best to have a “weed killer sprayer” for weed killing applications only and not attempt to clean it for other use. A sprayer or applicator marked plainly for “Weed Killer” use only would be highly desirable. Wash equipment (triple rinse) thoroughly and let it dry and air out completely before storing. Don’t allow spray drift to get onto your hands or clothing and then work among susceptible plants without thoroughly washing clothes and hands. Label all containers of 2,4D with permanent labels. Every year many mistakes are made in which the wrong chemicals are used for the purpose. Just this past season, one home owner sprayed not only his own roses but also those of a neighbor with a weed killer instead of the insecticide he thought he was using. Lawn Care Treatments – Does Rain Effect Them?